Sadly the whole street is not free of cars. So be careful you have to share with crazy drivers for most of it. 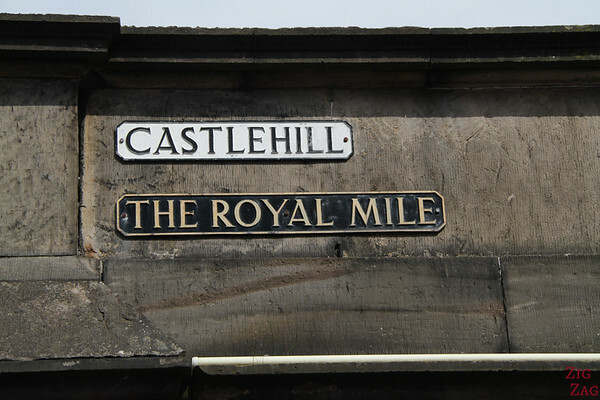 The Royal Mile Edinburgh starts at the Entrance of the Edinburgh Castle on top of Castle Hill. 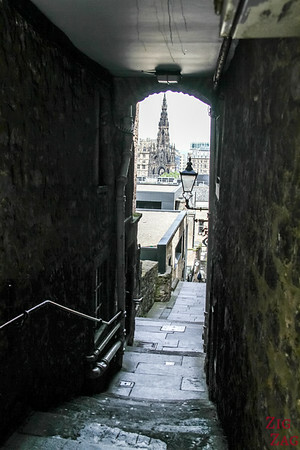 The medieval fortress is like a small town in the town with some beutiful views over Edinburgh. This is the beginning of the street. 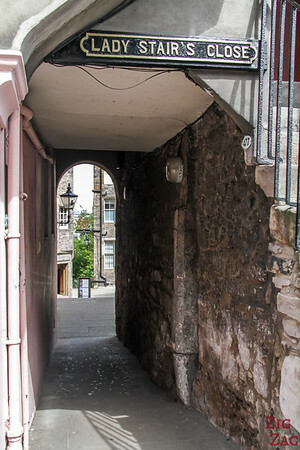 It is quite narrow but gets wider after the tall building called the Hub. 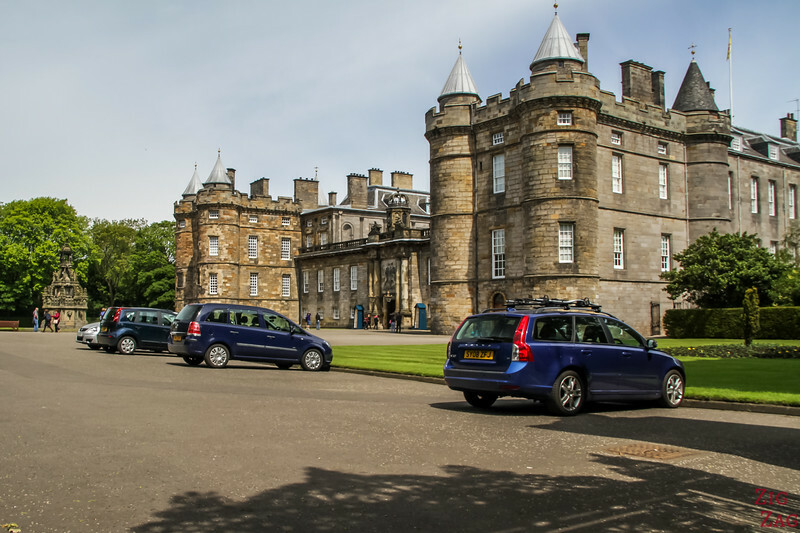 At the other end of the Royal Mile Edinburgh is the palace of Holyroodhouse, which is the official residence of Her Majesty the Queen in Scotland. Part of the palace can be visited. 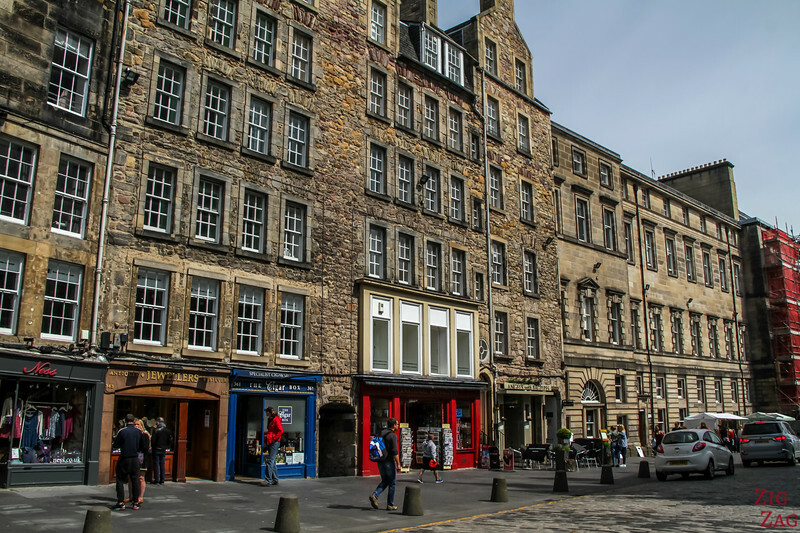 The first building you notice when walking down the Royal Mile is the this narrow towering building. 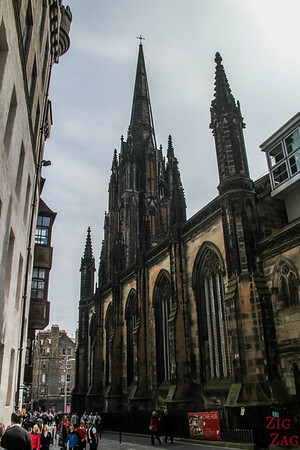 It is now called the Hub, a conference venue (at first I thought it was the cathedral that I will show you later in this article). 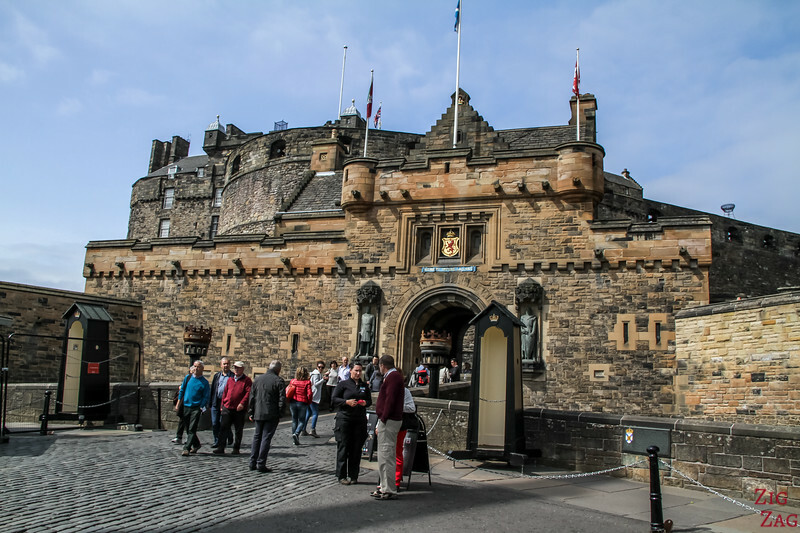 It is the home of the Edinburgh International Festival. 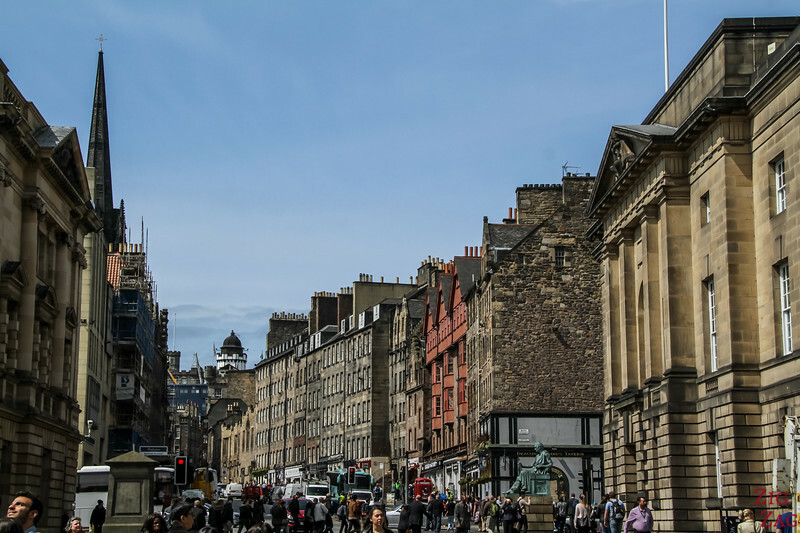 It is a mix of modern design and victorian architecture. 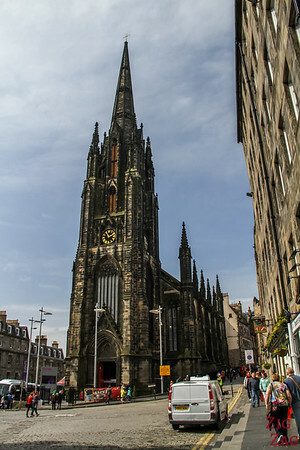 its spire dominates Central Edinburgh. 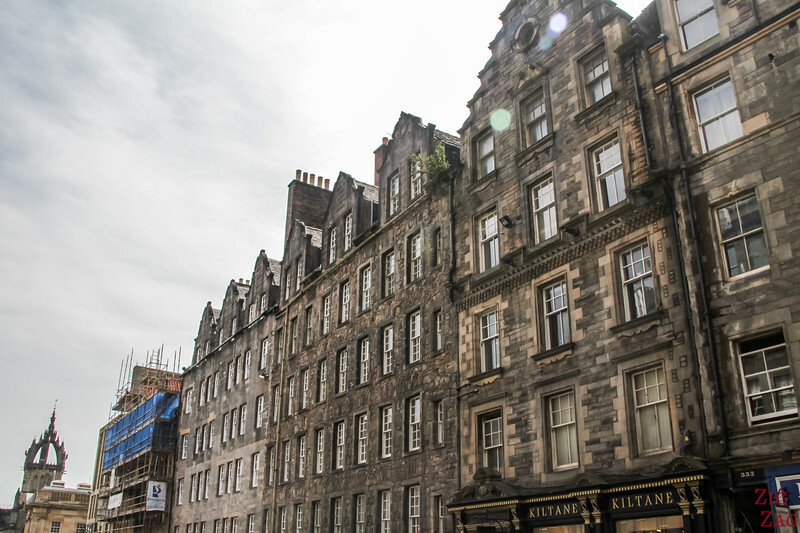 Surprisingly, it was built between 1842 and 1845. 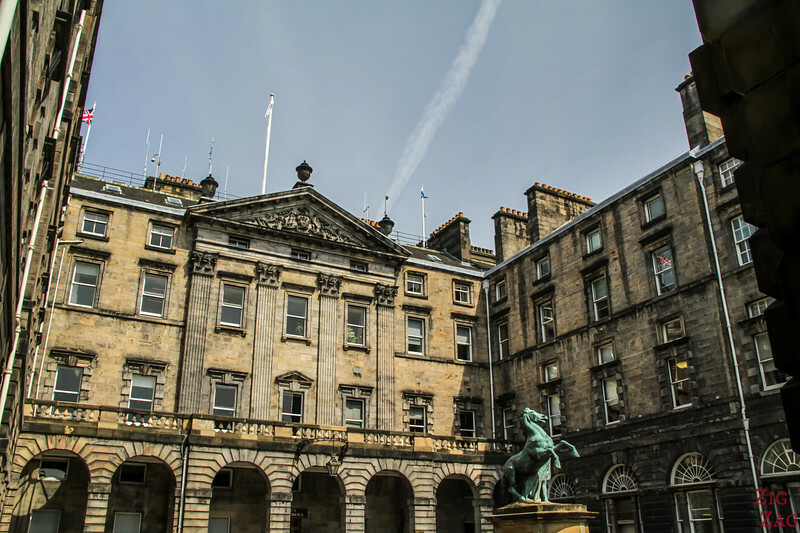 And not so surprisingly, it was previously used as a Church and general Assembly Hall for the church of Scotland. 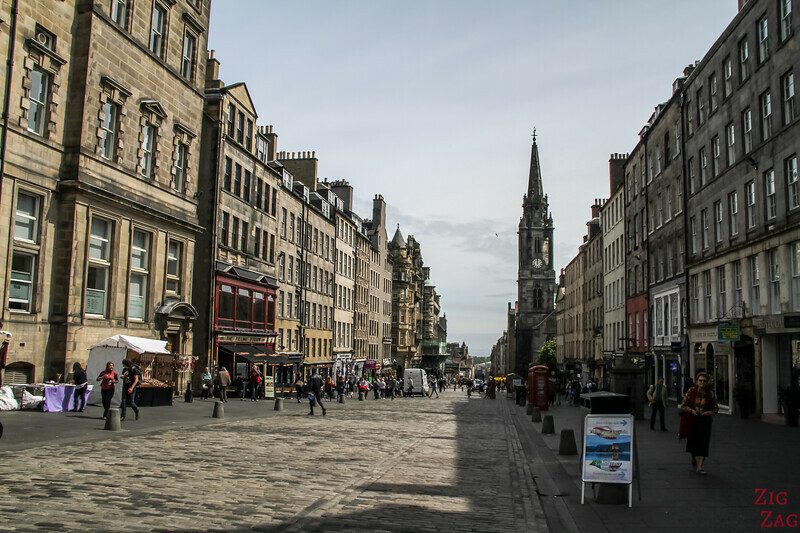 After the Hub, the street becomes wider. You can discovers rows of old 5-story buildings. Here, part of the street is forbidden to cars giving you more space and freedom to look around. 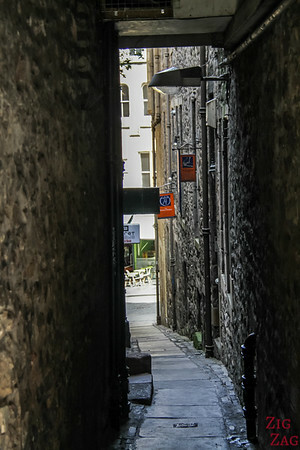 One of the main attractions and particularities of the Royal Mile Edinburgh are the narrow side street called 'closes'. Wikipedia has a list of the closes. 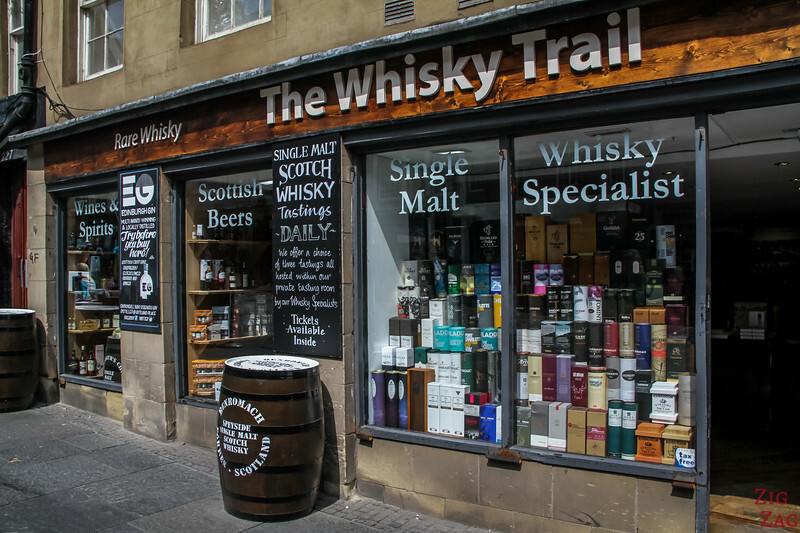 Those closes were usually named after a memorable occupant of an apartment or a trade made there. The Closes nearest to the castle can have steep slopes. 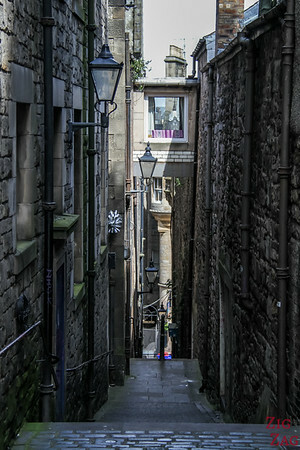 They are narrow and between tall buildings as housing was an issue when they were built. 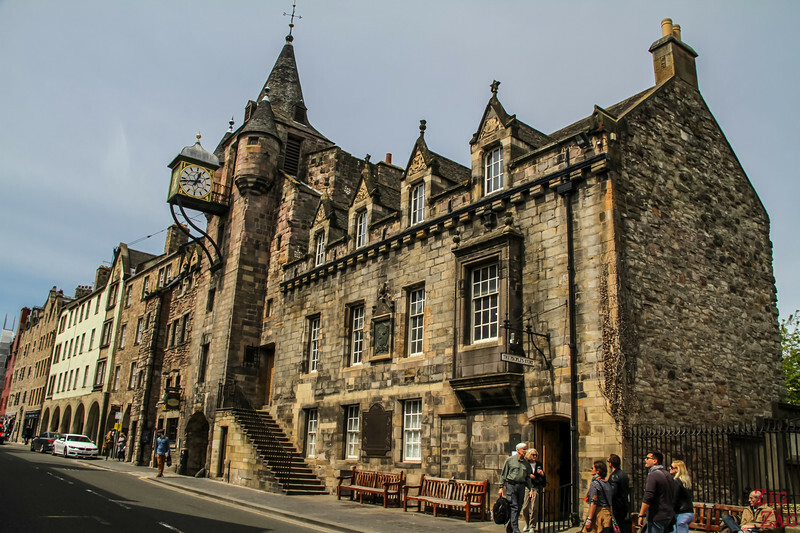 To its left of the city chambers is th﻿﻿﻿﻿e real Mary King's close where you can join a 1hour guided tour and visit the many hidden streets from the 17th century. 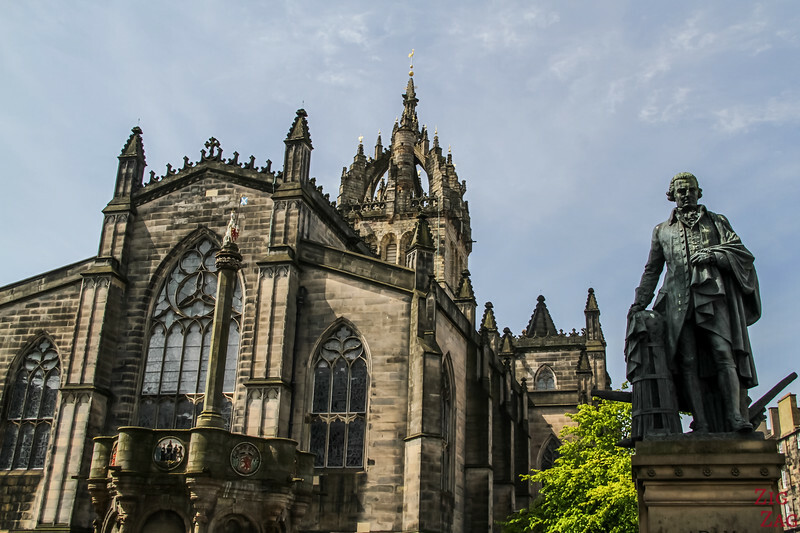 One of the main monument on the Royal Mile Edinburgh is the St Gile's Cathedral also known as the High Kirk of Edinburgh. 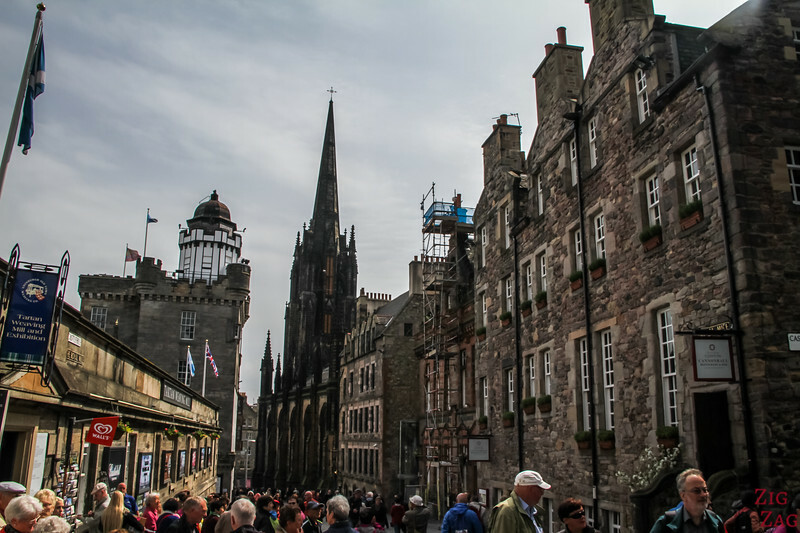 Its most famous feature is the crown-shaped spire. It was built in the late 14th century and restored in the 19th. 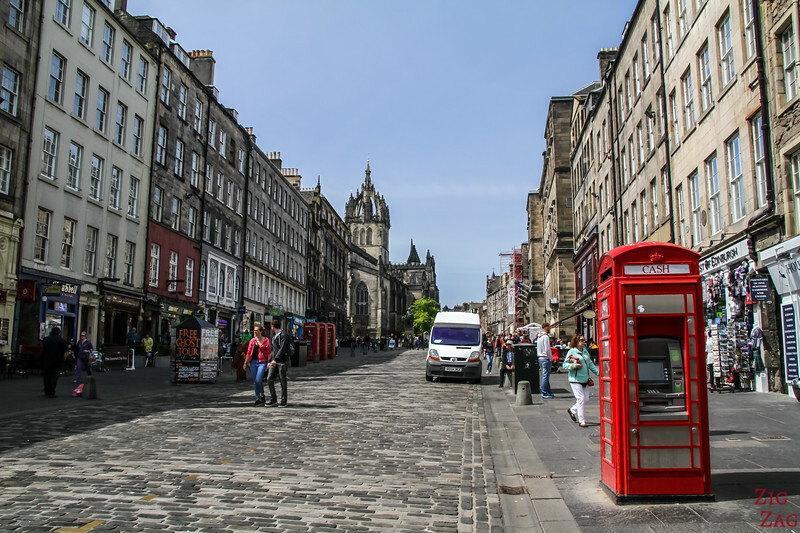 It is dedicated to St Giles, the Patron saint of Edinburgh. 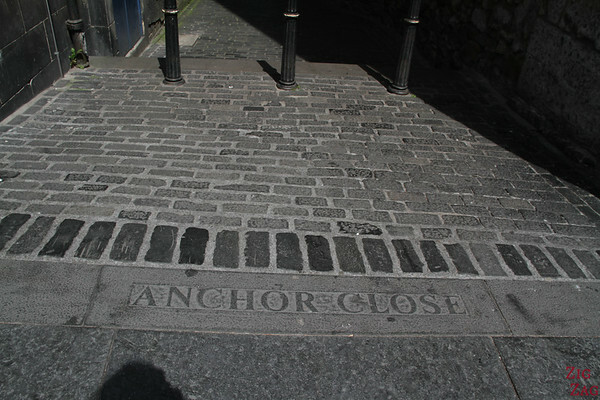 It stands one third of the way on the Royal Mile (nearest to the castle). The Cathedral is full of colorful stained glass window. 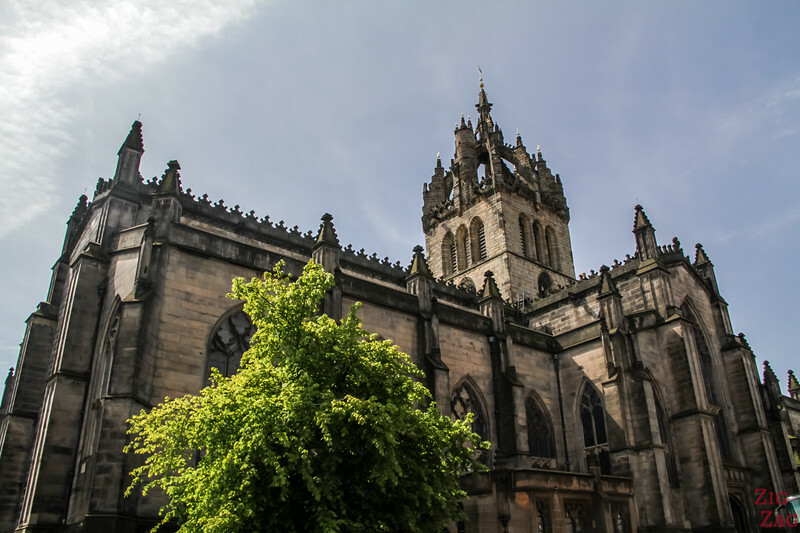 Have a look on my St Giles Edinburgh Cathedral article. The people's story building was my favorite on the whole street. I liked the state of the stone and the dungeon-like tower.